Much has been made of last week’s report from the Global Commission on the Economy and Climate, led by former Mexican President Felipe Calderón and famous climate economist Lord Nicholas Stern. The report’s conclusion that we can have our cake and eat it too — that is, that we can “create lasting economic growth while also tackling the immense risks of climate change” — quickly became a popular talking point for mainstream economists and politicians. But to think that it has anything to do with actually avoiding catastrophic climate havoc is to misinterpret the entire premise of this New Climate Economy (NCE) project. The question the project has sought to explore is not “how can greenhouse gas emissions be reduced?” … but “how can economic decision-makers achieve their principal goals while also reducing their impact on the climate? On their own, these measures would not be sufficient to achieve the full range of emissions reductions likely to be needed by 2030 to prevent dangerous climate change. One pundit goes so far as to credit Wall Street for enabling the transition to a green economy and climate-stable future, telling “hippies” to back off and let the oligarchs handle the business of saving humanity. 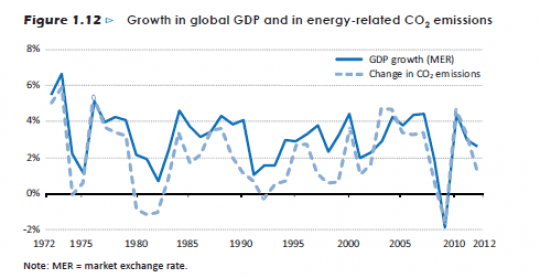 But growth-glorifying free-marketism has a dreadful track record for reducing emissions. Never mind that Elon Musk’s low-carbon brainchildren are crushing it on the stock exchange, gross domestic product — the thing that’s getting bigger when we talk about growth — is a terrible barometer of prosperity. The rapid build-out of renewables constitutes an enormous infrastructure project that will itself consume significant amounts of fossil-fuel energy. … The faster we push the transition, the more fossil fuels we’ll use for that purpose, and this could lead to the extraction of more tar sands, fracked tight oil and shale gas, deepwater oil, and Arctic oil. It’s not underinvestment in cleantech that’s changing the climate; it’s carbon emissions. Duh. So, the bigger question — the one that the NCE report strategically skirts — is this: Can we grow economically while we achieve climate stability? This question has been the focus of researchers experimenting with ways to stay within the global carbon budget, defined as the total fossil fuels we can burn and still maintain a 50-50 chance of limiting warming to 2 degrees Celsius. Kevin Anderson of the Tyndall Center for Climate Change Research at the U.K.’s University of East Anglia estimates that staying under the arbitrarily agreed-upon 2-degree ceiling in a way that allots poor countries their fair share of the carbon budget (a big share, since their historical emissions are relatively tiny) would require rich countries to reduce emissions by 10 percent per year. No countries are even setting targets consistent with such steep reductions, much less actually decreasing carbon emissions at that rate (or at all, from a consumption perspective). As for pulling off that sort of emissions downsizing with economic growth intact, look at recent history: These days, we’re not bringing down global carbon emissions at all while the economy’s growing. Since 1995, global energy-related carbon emissions have decreased just one year, 2009, which also happens to mark the only year in that stretch when global GDP decreased. Coincidence? … This does not simply mean producing and consuming more efficiently and shifting to renewable energy, necessary though these changes are. It also requires that we produce and consume less – a conclusion that few dare to utter. Fortunately, the extent of wasteful overconsumption in the developed nations means that degrowth can actually be in our own interests, if we manage the transition wisely. If that leaves your head spinning, not to worry, I’ll write more about degrowth and what that could look like in the future. But first, back to that pesky NCE study. Why all the confusion? Remember that the NCE report is about climate action not climate protection. That is, the report looks at economic benefits of climate-friendly investments, not at the economic realities of fixing the climate. Lord Stern, the big-name economist on the study’s commission, already knows that the necessary deep emissions cuts can’t be made while growing the economy. In his well-known Stern Review on the Economics of Climate Change from 2006, the limit for carbon reductions in the company of growth was set at 3 to 4 percent a year. He also acknowledges that, historically, emissions decreases of larger than 1 percent per year have coincided with periods of upheaval or recession — when, by definition, there is a negative growth rate. Maybe Stern found some new hopeful evidence to contradict his previous findings. Or maybe the numbers in this latest report have been thoroughly massaged to make them more palatable to politicians and businessfolk. All signs point to the latter. Perhaps the real message of the NCE report is: You can act on climate and still get elected! The Organisation for Economic Co-operation and Development (OECD) has projected that if current trends continue, as the global population grows from 7 billion in 2010 to more than 9 billion in 2050, per capita consumption will more than triple, from about US$6,600 to US$19,700 per year, and global GDP will nearly quadruple, requiring 80% more energy. Sustaining growth at that scale will only be possible with radically new business models, products and means of production. The call for radical change is promising. Now we just need to switch the priority from sustaining growth to sustaining the stable climate. Otherwise, a century from now, our fancy new low-carbon economy will be up to its transit-hub high-rises in simmering acidic seawater.